By Daniel Horowitz—It would be hard to imagine a more fitting way to usher in the inaugural Jewish Heritage Month in Ontario than by welcoming the President of Israel to town, and that's precisely what happened on Wednesday, May 9th. 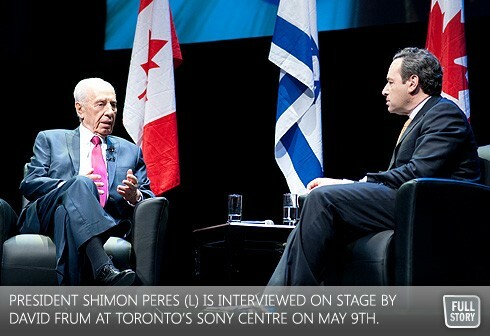 Billed as "A Special Evening with President Peres,” the event, organized by UJA Federation of Greater Toronto, saw a capacity crowd of over 3,000 enthusiastic Peres supporters fill Toronto's Sony Centre for the Performing Arts for what was just that, a special evening. After an emotional and compelling address by Master of Ceremonies Robert Lantos, the celebrated Canadian Producer behind such blockbusters as Barney's Version and Eastern Promises, Toronto's own David Frum, a CNN contributor, journalist, author, and political advisor joined President Peres onstage for what could best be described as a "fireside chat" - sans the fire. Despite nearing his 90th year, President Peres charmed the audience with his intellect and his wit. While discussing the current situation in the Middle East with regards to the Arab Spring, President Peres told Frum about a conversation he has had with his American President Barack Obama. He asked me 'who is against democracy in the Middle East?'" said Peres. "I told him ‘the husbands." The laughter the president received would have made Jerry Seinfeld, who performed at the Sony Centre just days earlier, envious. On more serious matters, when the subject of Iran came up, the Israeli President expressed optimism in international sanctions. "The fact that Iran is ready to enter negotiations shows that sanctions are having an impact," he said, expressing his preference for diplomatic methods over military action. On the topic of Syria, President Peres made it clear that he believes President Bashar Assad has simply done too much damage. "He's killed his own children ... he won't be forgiven." Speaking about Israel, which just celebrated its 64th anniversary, President Peres, mentioned his country's geographical limitations, and its lack of rain, and the fact that Israel "has only one lake, and two rivers. One is dead, and the other is dying," he told the audience which erupted in laughter. Then, outstretching his hands to the heavens, the president added: "When I see how much water you have here in Toronto, and in Canada, I am envious. In Israel, our man enriched the land, the land didn't enrich us." On the topic of the Jewish people's overall contributions to the world at large – and that while Jews are approximately 0.25% of the world's population yet account for approximately 22 percent of all Nobel Prize laureates worldwide, President Peres had a simple explanation. "We are too small to be average. If we don't have quantity we need to have quality," he said. President Peres then went on to thank Toronto's Jewish community who, he said, "has been there from the start, and is really a great friend of Israel's." Elizabeth Wolfe, Board Chair, UJA Federation, thanked President Peres for taking time out of his busy schedule to make the trip to Toronto. "Whenever Israel has been faced with challenges, Toronto's Jewish community - led by UJA Federation of Greater Toronto - has not only risen to meet those challenges, but has soared above and beyond the call of duty," she said. "UJA Federation's commitment to Israel is demonstrated by the 15,000 participants at our annual Walk with Israel, during our Yom Ha'atzmaut festivities, and by the myriad of Israel-related programs that fill our calendar, including this evening's. President Peres, I thank you for taking time to visit your friends – and yes, your family - here in Jewish Toronto. Your presence underscores the importance of the work UJA Federation does on behalf of Israel and Jews everywhere."